When you imagine a career opportunity, what do you see? If you're looking for professional adventure with talented colleagues, Cliffs Natural Resources offers a wide variety of jobs, from internships to full-time employment. No matter what course you set with Cliffs, you'll work on important projects, and you'll have the support of a responsive organization that looks out for you. As we continue to move forward as an industry leader, we're always searching for the best and brightest individuals to join our team. To point your career toward success, explore a job through the University Careers program at Cliffs. 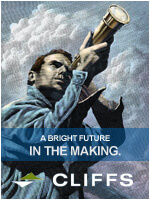 At Cliffs, you'll see significant responsibilities right from the start. Whether you're involved in long- or short-range mine planning, operations, processing or reclamation, you'll gain valuable exposure to the different aspects of operating a mine while putting your education to work on the latest technology and heavy equipment. Whatever career direction you choose at Cliffs, you'll have the opportunity to build your experience and develop your skills. Our internship program is one of the most sought-after in the mining industry. When you join us as an intern, you'll discover a valuable program that will expand your career possibilities and empower you to achieve your highest potential. Over the course of our 12-week program, you'll receive important industry training, and you'll get involved in meaningful real-world projects like planning a drill program, designing a new process, or implementing a new technology. Ready to see what's ahead in your career? Start an internship at Cliffs.